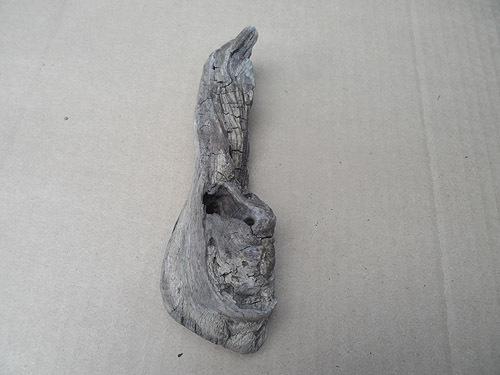 Driftwood for sale – DRIFTWOOD LOT NUMBER 150119D – R200. 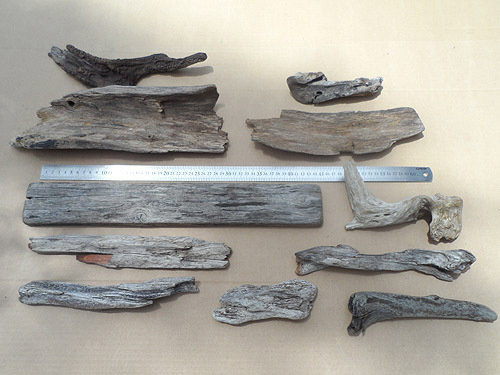 11 Driftwood pieces for sale for R200. Take note of the 60cm ruler in the photos to get an idea of the length of each piece. 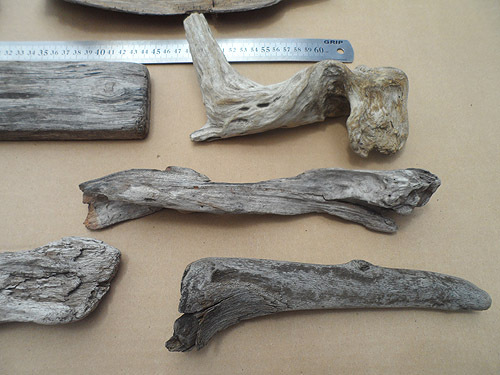 All 11 of these driftwood pieces are quite hard, except that the piece just above the ruler on the right is quite thin bark. 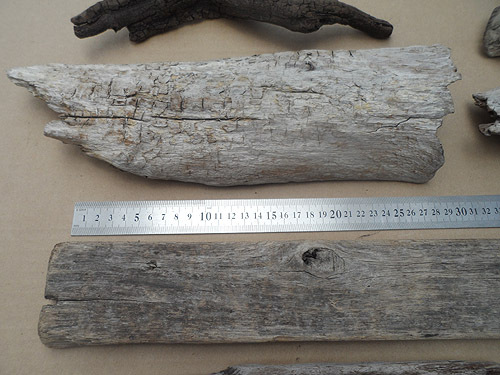 Other than the dark one top left, the two bark pieces just above the ruler, and the one on the right just beneath the ruler, the general colouring for all these pieces is light grey. 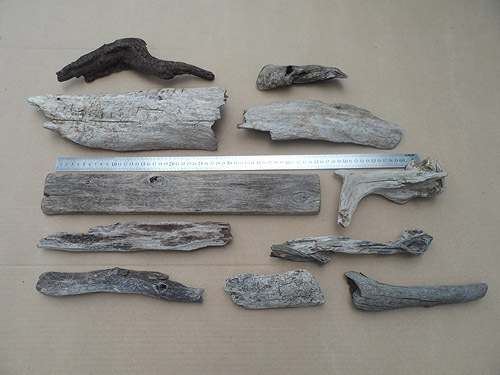 Several photos are shown here of just this ONE driftwood lot 150119D. 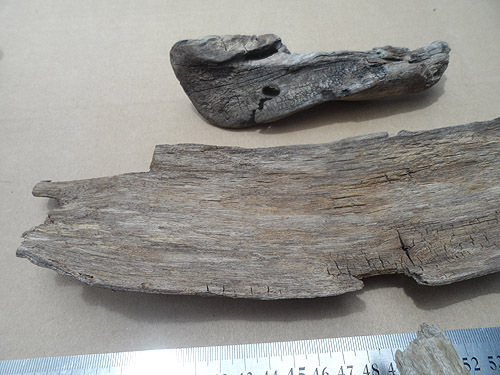 driftwood lot 150119D – two pieces – what appears to be a nice thick bark piece, and a plank piece. 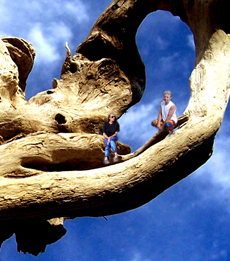 Driftwood lot 150119D – faces chatting – these are the same two pieces as in the previous photo, except that the photo was taken from a different angle. We were actually just wanting to show how the “twist” piece on the left in this photo looks a bit like a head of some creature with a smiley face (seen in mostly profile) but then we were looking at the photos afterwards saw that the piece on the right also looks like a face. These two creatures or comical characters appear to be chatting with each other. 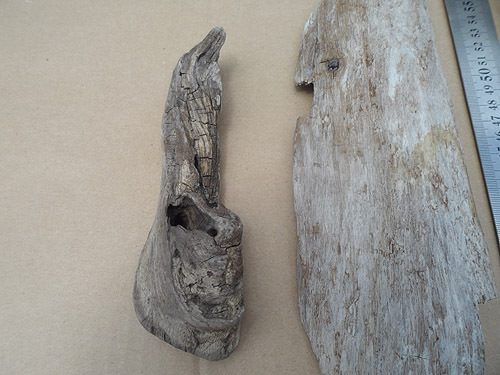 Struggle to see faces in driftwood pieces or other objects? Always first look for something that could be one eye or two eyes, then the “rest of the face” sort of just falls into place. 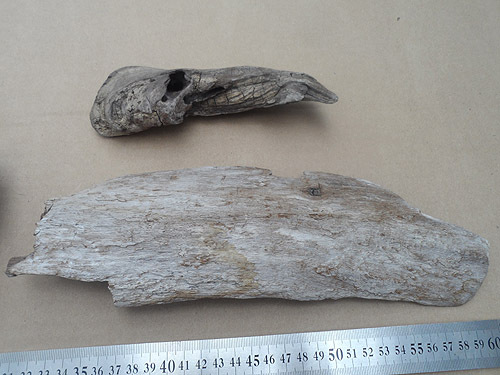 Also see our blog post: Can you see a driftwood face? 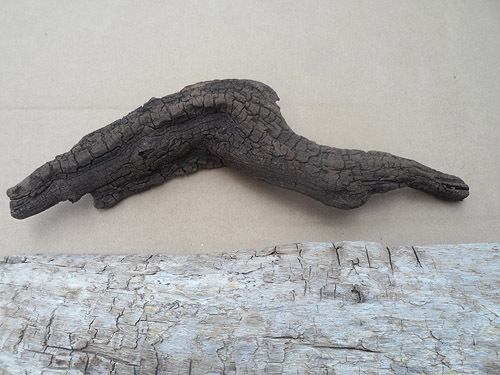 Driftwood lot 150119D – friendly or scary – we really like this little creature (or long odd-shaped head of a creature, or maybe that’s his hair going straight up above his eye), but we can’t work out if he looks friendly or scary. He has a really big grin. 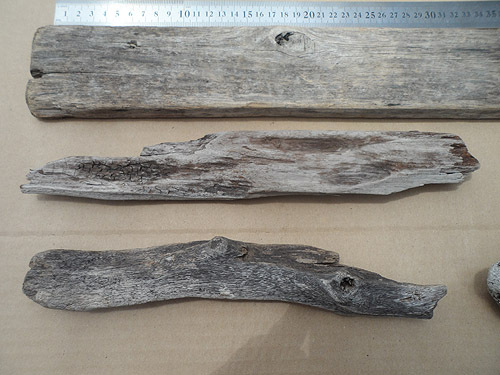 driftwood lot 150119D – three pieces – a closer shot of the area bottom left in the first photo on this page. 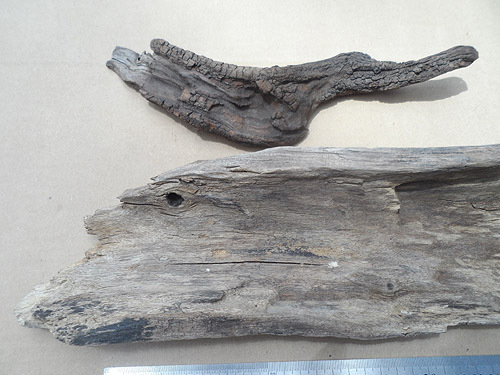 Note that the middle piece pictured here has a flaw on its other side (a piece is broken off – see in the flipped over photo further below) but this driftwood piece is still fine for use if just the one side needs to show in your driftwood decor project or driftwood craft project. Since the majority of these 11 pieces are light grey in colour, start thinking about how they would suit your light grey or grey and white decor ideas. This entry was posted in Driftwood, For Sale on January 17, 2019 by The Driftwood People - Terry and Tony.